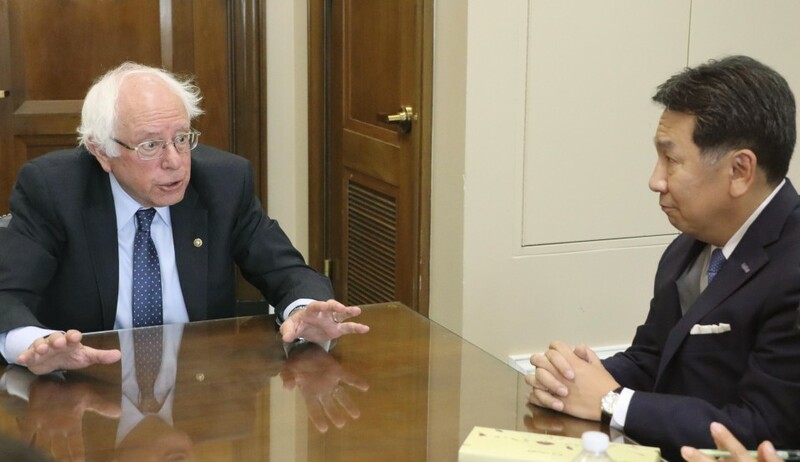 The leader of Japan's main opposition party Yukio Edano said Thursday he hopes to run a Bernie Sanders-like grassroots political campaign in the upcoming election after meeting the U.S. senator in Washington. Speaking to reporters after a sitdown with Sanders, Edano, head of the Constitutional Democratic Party of Japan, indicated he believes some of the left-leaning senator's policies, such as free university education, could gain support among young Japanese people ahead of next year's House of Councillors election. "Japan shares challenges with the United States about student loans for tuition," said Edano, who is on a five-day visit to the U.S. capital through Saturday. "I would like to step up an appeal on the issue." Edano said his party is aiming to strengthen democracy through grassroots campaigning, suggesting that, like the 77-year-old Sanders, he wants to marshal a youth movement for political change. Edano said Sanders expressed his concern that democracy has fallen into crisis globally, an apparent jab at Republican President Donald Trump's administration and the factors that aided his rise. The senator for Vermont went head-to-head in the 2016 Democratic presidential primaries with Hillary Clinton, a former secretary of state whom Trump went on to beat in the presidential election later the same year. In a speech at George Washington University later Thursday, Edano reiterated his opposition to Prime Minister Shinzo Abe's push to advance the planned relocation of a U.S. military base within Okinawa Prefecture. Edano said that if the Abe government goes ahead with the planned transfer of the U.S. Marine Corps Air Station Futenma from a crowded residential area in Ginowan to the less populated coastal district of Henoko in Nago, Japan-U.S. relations would suffer due to increased local resentment of U.S. forces in Japan. Edano called for a revision of the Japan-U.S. Status of Forces Agreement, criticizing it as "unequal" and "unfair" because it is overly protective of U.S. service members and civilian base workers when they are implicated in crimes. Touching on North Korea's abduction of Japanese nationals in the 1970s and 1980s, Edano suggested the Japanese government should set up a liaison office in Pyongyang as part of efforts to address the issue.